Below you will see why I think teaching math basics with number bonds is the best way for your homeschoolers to learn math. Over our last four years of homeschooling, I have used several different math curricula. Some I liked better the others, but they all had their own strengths and weaknesses. One of the strengths of one particular curriculum we use, Singapore Math, is their method of teaching basic math facts. Instead of teaching fact families by rote, Singapore illustrates fact families using number bonds. Now, I realize this is just my unprofessional opinion, but as a self-professed math geek, I truly believe number bonds are (likely) the best ways to teach math facts. They're simple. They're visual. And they're extremely effective. If you're not familiar with what number bonds are, allow me to illustrate. As in the example for addition on the left, the student is taught to recognize that the number 7 is made of 3 and 4. Understanding that basic concept, the student is then able to see clearly the rest of the facts in that family, in both addition and subtraction. It works exactly the same way for multiplication and division. 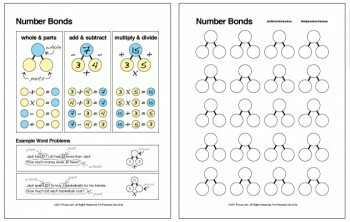 If you'd like to teach your children number bonds, you can download my Number Bond Chart and Worksheet set here. 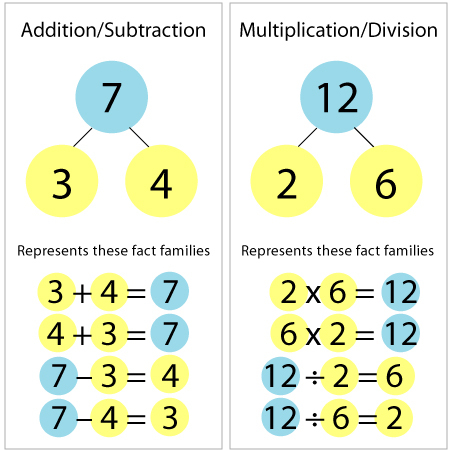 Not only does teaching fact families with number bonds simplify the learning process tremendously, it also reduces the number of flashcards needed for drills. We own two sets of three-corner flash cards to cover all four operations. 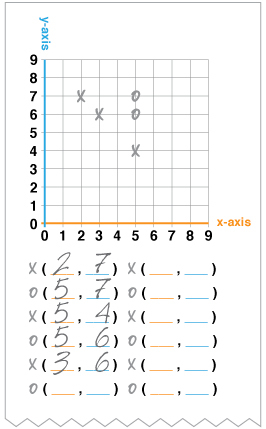 When I drill, depending on which number I cover, I can use a single flashcard to drill 3 different facts in two operations.For example, when using the multiplication cards, if I cover the top number, I'm drilling multiplication; if I cover either of the bottom numbers, I'm drilling division. One of the biggest benefits of teaching math basics with number bonds is that it helps children think algebraically. When they look at a basic equation in any operation, they can recognize which of the numbers is the "whole" — the number that goes at the top of the number bond — based on its position in the equation. This is truly a skill that can help children in any math course and throughout the rest of their lives. So regardless of the math curriculum you use, you might want to consider using number bonds when your child learns about fact families. I think you'll be glad you did. I struggled with math as a child…not sure if this method would have helped me, but I always like learning about new curriculum and concepts to use. For the number bonds, do they also cover 2 + 5 = 7 and 3 x 4 = 12? @Grace, Most definitely it covers that. The number bond concept just represent each number as a sum of its various addends or the product of its various factors. All the 'families' are taught that way. I only used those two number bonds in my example as a single illustration of the concept. Where do you get these flashcards? @Abigail, We bought ours at our local homeschool store. But you can get them on Amazon.com too. I'd imagine that teacher supply stores would also carry them. Thank you! I will look for them. We are going to, hopefully, finally get into our house within a month to two. We were already looking at using the big sheets at Lowe's for the back of our son's bedroom door and maybe even part of his wall. We checked into the paint they have for that, but it is very expensive. The sheets are definitely cheaper. LOL…I just realized that I posted this comment on the wrong post! @Jolyn, I'm sure Singapore didn't pioneer the method, but it's definitely what they use. Their model method is also what makes their curriculum so unique, and so effective for problem solving. Each of my children has used Singapore at some point in their elementary years. I can't believe I've been doing this so long and never heard of this! Saw your tweet and had to come see. The theory also jives with what they say about adding color to things to make it 'sticky' in the brain. I may need to get some of these. Thanks for sharing! This is my first year of homeschooling (my oldest is kindergarten). From Aug-Dec, this poor son and I struggled through Horizons Math. It is a sprial curriculum and drove us both *insane*. I am ashamed to say that it didn't even dawn on me to switch curricula. But thankfully, it finally did occur to me. L-o-v-e it. Love number bonds. Love the way it uses manipulatives. Love the way there isn't tons of writing. Just love it. Unlike you, I am NOT a math person and I also believe it is the best way to teach math facts. My 5yo has a little logical mind and he picked right up. Now math is one of the best things we do all day! 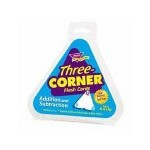 I just ordered the Three-cornered flash cards. I've never seen those! It wasn't Prime shipping, but it was free! Can't beat that. I just came across this article on Stumble Upon. I've been homeschooling for 16 years. I've never used Singapore but have heard good things about it. The number bonds sounds wonderful. I'd say that in addition to that, including some Saxon methods would be good too. I love how Saxon starts young children with large motor manipulation: The couch is a "bus". Five stuffed animals got on the "bus". At the next bus stop, three more animals got on. How many animals are on the "bus" now? Then moves to smaller motor manipulation: There are three groups of M&M's (or raisins, etc.). There are five M&M's in each group. Count by fives to find out how many there are all together. Then of course they get to eat the M&M's and share them with their siblings. Saxon teaches that the "x" in multiplication means "groups of" (3×5 is read as 3 groups of 5). Saxon also avoids as much rote memorization as possible. For example, they memorize their doubles facts (3+3=6 and 4+4=8) which tend to be easy to memorize. Then they learn that if two numbers are next to each other when we count, they double the smaller number and add one (3+3=6 so 3+4=7). I've found that teaching various methods helps children to see math from different angles and understand it better. Also, one method will make more sense to one child and a different method will make more sense to another child. Be creative. Just because the curriculum tells you to teach a certain way doesn't mean it's the only way. your website is an absolute treasure trove of wonderful and relevant information for me. My first grader is being home-schooled and I am always on the search for making learning a fun and enjoyable experience. The Illustration of the Number Bonds with their Fact Families is exactly what I was looking for! Would you be able to offer the Illustration above as a template; leaving the colored circles bland and allowing the user to fill in any number of their choosing? It would be such a useful teaching tool. Thank you for your time and thank you for your website. After reading your little bio at the bottom of this page, I now know why your website looked so professional. You're a web and graphic designer. Correction to my initial post above. Originally I stated: "Would you be able to offer the Illustration above as a template; leaving the colored circles bland and allowing the user to fill in any number of their choosing?" The word bland should be BLANK, not bland. Thank you so much for sharing this teaching concept. My 10 yr. old still struggles with basic math facts and I've tried a lot of ways to teach him. Rote memorization does not work! Word problems have been impossibly frustrating. I've never seen number bonds presented to be taught this way. Definitely going to try! Thank you so much for sharing this useful template, especially for someone like me who is quite lacking in tech skills (or computer programs?) to create worksheets like this. @Joyce, I hope it works for you! Have you seen my videos on multiplication and division? They might be helpful as well. My daughter was adding and subtracting at age three and taught herself multiplication by age four while going to a Montessori school. At age 5 we moved her to a charter school and in first grade they started teaching her addition and subtraction with number bonds. She has never been so confused in math. Infact, 6 months into first grade she is worse at math in some respects than when she started at the beginning of the year. I have been struggling to keep her from being completely lost. The Montessori school she attended used groups similar to what the number bond concept is supposed to do without the weird symbols. I could see using these circles and lines to a 3 or 4 year old, but why confuse children with unconventional symbols. I am taking my child out of this school primarily because of their insistence on continuing to use number bonds to teach children math. I'd hate to see someone like my daughter who is so natural at math end up hating it all over some stupid symbology. I understand that every child learns differently and am all for trying number bonds as a method to help children who are struggling, but I can not see any reason at all to use this method as "the way". It obviously isn't as intuitive as people make it seem to be or my child, who has basically taught herself addition, subtraction, and multiplication wouldn't be so confused. what's the (alleged) merit of this approach? flash cards are a nice way to get through rote memorization tasks, and as far as i can see that's all that's been accomplished here. what you gain in not making two separate facts of "12 – 3 = 9" and "3 + 9 = 12", you *more* than pay for by making the distinction between "12 3 9" and "12 3 4" context dependent and not explicit. "you know what i mean" hand-waving is the opposite of math, and it is also the opposite of teaching math. The advantage is in visualizing the 'parts' and 'whole' for each fact family and to recognize that multiplication/division and addition/subtraction are not different operations, but in fact two sides of the same coin, simply a different way to manipulate 'parts' and 'wholes'. Plz help me with bonds more example im struggling 2 understand.What r they sdaying if they say bonds of 14,15 nd 16 etc.Plz help its 4 my sons homework nd test.Thank u . Thank you so much for your page here. My 1st grader struggles with the concepts she's supposed to have learned by this age, for example to add within 5, and it just wasn't in the cards for her in the classroom. Now in 1st grade she doesn't even know what 2-1 equals (she thinks it's zero, and no, counting on her fingers hasn't caught on because she'll say "minus one" and drop 2 fingers). And she still has to use her fingers to add 1 to any small number so I know she's off track (I'm lucky if she doesn't accidentally put up 2 fingers instead). And in researching something to help her with that, that's off the beaten path, I stumbled onto this page. I took the advice and bought the 3 sided flash cards. I also found a game called Math Dice, Jr. at the same shop and we started working with the materials this week, and I'm going to print out your blank worksheet to use. She was interested and not bored at all with the cards so I hope it stays that way. I like that they're so flexible so we can change course when needed, and she can do the problems that she wants to do. I remember being in school and math not clicking for me until 4th or 5th grade, and by that time I had to figure out a way to do it on my own in my head, a sort of roundabout math, because I couldn't get with the way they were teaching me, all the carrying over and crossing out a number and skipping a place (or however it goes). (For example 51-13: 13 to 20 is 7, 20 to 50 is 30, makes 37 + 1 = 38, and then checking the work in my head 38 to 48 is 10 + 3 = 51.) And copying the facts in school made me ILL and didn't help me a bit, so to see new products on the market like this is fun for me. Thank you for introducing this method and we plan on using these materials for about 2 hrs/week.